Click here to download discussion questions. En Espanol. Click here to download historical background En Espanol. The cost of a Tuditanus presentation is quite reasonable and within the realm of any budget. Publius Sempronius Tuditanus will speak to any organization or group…school, church, youth group, Sunday School, Bible study, etc., for a nominal fee. To schedule a performance, please email Steve at steve@stevenrperkins.com. 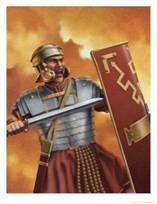 Yet often our imagination asks, “What would it really have been like to be there?” Now your imagination can come to life through the fictional character Publius Sempronius Tuditanus, one of the Roman soldiers who guarded the tomb of Jesus and was an eyewitness to history! Latin teacher and author Steve Perkins will transport you to the first century A.D. through the persona of Publius Sempronius Tuditanus, one of the Roman soldiers who was picked to guard the tomb of Jesus and who bore witness to the event that changed the world. The four gospels of the New Testament tell us the events immediately leading up to the crucifixion of Jesus. Through the eyes of the fictional soldier Tuditanus you will experience such things as Jesus’ triumphal entry into Jerusalem, His beating, and His crucifixion as never before. You will also hear about the healing of the centurion’s servant, told in Matthew 8:5-13 and Luke 7:1-10. You will see the prophecy of Isaiah 53, describing Jesus’ humble appearance, come to life. And, from details of the so-called Gospel of Peter, you will share in the experience of a centurion named Petronius and the soldiers who stood with him at the tomb. Wearing reproduction armor of a Roman soldier from the first century A.D., Steve Perkins becomes Publius Sempronius Tuditanus of the Sixth Legion Ferrata, which was stationed in Judea under Pontius Pilate. Through an engaging blend of fact and historical fiction, the character of Tuditanus gives you a front-row seat to history.